Israeli-made weapons, along with plans for the construction of a new US military base in strategic Bab al-Mandeb Strait, have been discovered in the Saudi embassy in Yemen's capital, according to the Iranian Fars news agency. The Farsreportcites sources among Houthi rebels fighting against forces loyal to Yemen's fugitive President Abd Rabbuh Mansour Hadi and their Saudi allies. It claims the rebels drove some 40 Saudi guards from the embassy to capture the compound. In the embassy, the Houthis discovered a cache of weapons and ammunition made in Israel. According to Fars news, the Saudi government has asked Tel-Aviv for weapons to supply what the report calls "terrorist groups" and forces loyal to President Hadi. The report also claims documents were discovered in the embassy detailing the US intends to build a military base on Mayyun Island near the Bab al-Mandeb Strait "to protect their own interests and ensure the security of Israel." The island is part of Saudi Arabia. "The Saudis are using Israeli weapons in their raids on Yemen," the Fars report says, quoting Yemeni Army Commander Taher Rasoul. The Shiite Houthi rebels captured the presidential palace in Sanaa forcing President Hadi to flee in January 2014. He has been in Saudi Arabia ever since. 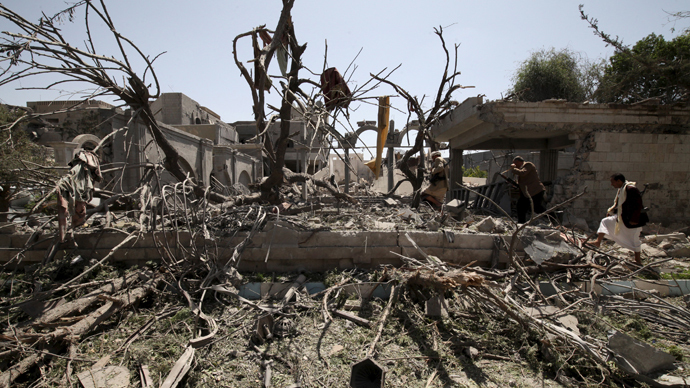 In March 2015, the Saudis, leading a coalition of Sunni states supported by the US, started a bombing campaign and blockade of Yemen in an effort to curb the Houthis' advance. The conflict has claimed a total of about 2,000 lives, according to UN estimates. Iran's regional rivals claim Shia powerhouse Tehran supports the Houthis in a bid to gain more control over the entire Gulf area.